The house felt comfortable, the other guests were very nice, and Manfred is extremely welcoming and helpful. I was particularly grateful that he was happy to lend me a mountain bike. The ride up to the volcano was very long and steep - but there are also buses leaving from very close to the hostel to the volcano (really worth visiting) and also down to the coast. There's a traditional water mill close to the hostel where you can buy tasty 'toasted flour' typical of the Canaries. Beautiful, quaint little house with a wonderful view of the city. Multiple bathrooms and good size rooms. Kitchen is a decent size but may have you getting in the way of others if everyone eats at the same time. The staff is very nice and accommodating. They were even nice enough to take me to the airport for a 7:15 flight when they didn't have to. Will definitely book there again! Manfred was SO helpful and knowledgeable about tenerife! i came to tenerife to hike and he gave me info about hikes, buses and timetables, and even had extra gear for me to borrow. la orotava is perfect for those looking to get away from the big tourist spots and have an authentic experience but still only 20 minutes from the major hiking spots. this hostel is very central and the ideal place to access all you need to access on the island. the house itself is old and beautiful. highly recommend! Really lovely hostel, amazing location in the old town with a beautiful view. The place is a traditional old house, nice vibe around it (and without any ghosts, haha! ;) The furnishing might not be modern, but it is well kept and clean. The host, Manfred, and his colleague (Juan?) are down-to-Eart people. I also got good tips where to go in La Orotava. When I am back in Tenerife, I'll surely stay there again or recommend this place to my friends. Manfred is a great guy, really helpful and friendly, and knows all the walking routes. Thanks for your help Manfred! The hostel was friendly and welcoming, and it was great to have the kitchen. The only downside is that smoking was allowed in the central courtyard, and smoke gets into the rooms and common spaces. Not good if you have asthma or an allergy to cigarette smoke, or just dislike the smell of smoke in your bedroom. That was the only downside to my stay. Otherwise a great place. 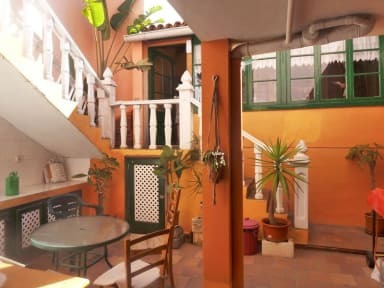 Nice guesthouse, which is more of a home experience, Manfred is the owner and will be helpful and keen on giving you some good tips about the Island, maybe there is a lack of big communal areas but overall is nice cosy place, meet nice people there, would definetly repeat if I pop at La Orotava again. Lovely hostel, I liked the fact of living in a old canary house. Amazing terrace with breathtaking views over the ocean and of the start at night. No bunk beds, which is a plus, kitchen fully equipped. It was just weird to have to check in before 1 or after 6pm, as the owner was not there when I stayed and his substitute couldn’t possibly be there in the normal check in times. Would recommend only to people with a car as it’s very steep to get here on foot. Nice hostel, the owner is very helpful and has good tips for hiking. There weren't many young people though and the hostel unfortunately didn't have a very social atmosphere.